Contrary to popular belief, the biggest challenge for the painter is not to reproduce the reality in the best possible way, but to present this reality in a clear and comprehensible way for the viewer. Often, contours, shadows or reflections are less beautiful in reality than on the painting. Take for example a thin cord that is overshadowed on a particular place by a glass through which you see the background and in whitch at the same time the foreground reflects. Or holes in a piece of hanging lace where the light shines through. These are examples of items that you can observe in reality but, because of the complexity of shapes and shadows, do not always know exactly what is alpha and what is omega. You won't blame reality for that. However, when observing a painting you will demand your right to know what you are looking at. The painter who made it is your guide there. For example a bunch of seemingly careless thrown down objects which are dark on very specific spots and therefore not clearly discernible. Here Nature should be helped a hand so to speak. Light effects made slightly stronger, or even toned ,can do the trick. As a matter of fact, all kinds of tricks are needed to bring the still life to taste. To the extent that the unsuspecting spectator can experience three dimensional reality again within the boundaries of the two-dimensional panel. The spectator is subconsciously looking for an aesthetic value, which is generated by, for example, a slightly stronger shiny reflection, a slightly brighter color, dynamic and contrasting background. It is sometimes a walk on the thin line between art and kitsch. Thus it becomes clear that chiaroscuro is much more than adding some dark shadows. 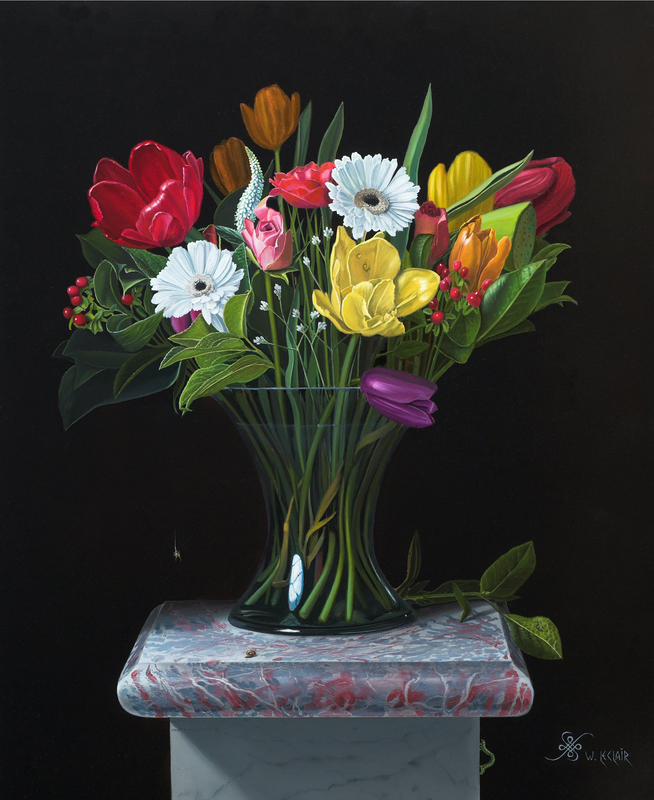 A traditional still life is a meticulous construction, a search for the exact right line. And then the final painting achieves such a submissive state of completeness that it simply "is." Exactly, Zen. It does not make sense, regarding the choice of items, to rely over and over again on just antique or 'rustic' items. On the other hand one can not deny how little atmosphere and content many contemporary objects often just have. The link with the present store is not always easy. Of course, the painter of all these predominantly dead objects is also a human being. His personality sneaks in subtly, sometimes consciously, telling the audience a story by the choice of the objects, the use of color, but especially by abstract realities such as the dynamics of objects opposed to each other or the light and dark balance. Personally, I love stuffing a painting with barely visible detail: a ultrafine crack, scattered water droplets where the light shines through or a small reflection of a window in glassware, in which a much smaller silhouette of a flying plane is processed. Thus, the subsequent owner of the painting discovers new things in it for a long time. Meanwhile, to create a hyperrealistic painting is a bit of a fight. A fight with the objects that put themselves not automatically in the proper position, a fight with the tough viscous paint , a fight with your eyes that always have to be on a needlesharp standby. Finally a good still life, painted in hyperrealistic style is something that cedes far from the lifeless things that originally gave shape to it. When people after this long detour and reinterpretation say: 'It looks so real!" then the task of the painter is completed.